MONTANTON – Northumberland County Coroner James Kelley has released the name of the driver of a pick-up truck who died from Friday’s severe crash involving a tour bus along Route 147. Kelley says 32-year-old Ramon Molina-Lozada of Sunbury was pronounced dead at the scene by Deputy Coroner Gabe DeMarco at 2:42 p.m. Kelley says Molina-Lozada died as a result of multiple blunt force trauma. Toxicology testing is being performed. No further information is being released at this time by the coroner’s office. Friday’s three-vehicle crash involving a tour bus and two pick-up trucks also injured about 40 people. Milton state police tell us the crash occurred just after 2 p.m. on Route 147 at the intersection with Route 405 in West Chillisquaque Township, Northumberland County. 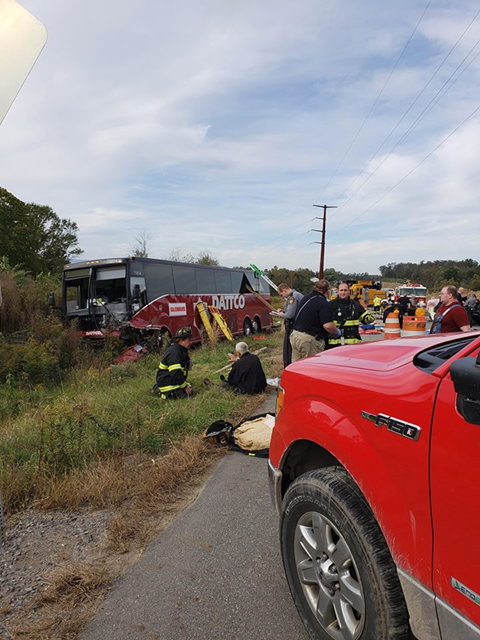 Troopers say the crash occurred when the driver of a pick-up truck crossed the center line of the road and side-swiped a pick-up truck, and then went on to hit the tour bus, head-on. Afterward, the bus went off the roadway. Dozens of people on the bus were injured. Geisinger tells us six patients were treated there, two are still listed in critical condition, one is listed in fair condition. All other patients were treated and released. Officials at Evangelical Community Hospital tell us 33 people were treated with mostly minor injuries, and the majority of patients have been or will be discharged. Multiple media reports also say the bus was carrying tourists from New Zealand and Australia. Emergency crews from Lewisburg, Milton, and as far away as Lycoming County responded to the scene. Multiple local and regional police departments responded. PennDOT says all lanes of Route 147 re-opened around 10 p.m. Friday.